If you’re like a lot of cat owners we know, you probably have a love/hate relationship with your furry friend’s litter box. One the one hand, you know it’s an essential tool that allows your kitty to remain housebroken, healthy, and happy. Boy can it be a pain to clean up. Plus there’s nothing less embarrassing than having guests over and worrying about if they can smell your animal’s “throne,” so to say. Clearly, using the right kind of kitty litter for your household is an important step in making the most out of this less-than-glamorous aspect of owning a kitty. But there are, oh let’s say a MILLION different brands and types to choose from. For many pet parents, PrettyLitter passes with flying colors. How Do You Use PrettyLitter? PrettyLitter was created by a man named Daniel Rotman. He was inspired to create this product by his own loss of a kitty due to an illness. He was frustrated by his inability to recognize his cat’s illness early on—at a time when he may have been able to help her. As a result, he teamed up with veterinarians and scientists to create a product that would be able to provide simple and unmissable signs of a potential feline illness…with the end result being faster detection, faster diagnosis, faster treatment, and hopefully better outcomes. Pretty kitter litter is a type of cat litter that changes color (we’ll talk later about why that matters). It’s made of a silica gel that comes in a crystal form known as sodium silicate, which is safe for cats and kittens. The crystals also have a proprietary blend of indicators which can monitor urine pH…we’ll learn about why that’s beneficial in a little bit. Compared to traditional clumping litter (which contains a compound that may expand in a cat’s digestive tract, potentially causing gastrointestinal blockages and upset), pretty litter granules do not clump nor expand. They are made with silica gel—a natural mineral—which is extremely absorptive and safe even if accidentally ingested by your feline. PrettyLitter is also low dust and has no fragrances added, which in general makes it a safe option for kitties (and humans) with sensitive skin or respiratory illnesses. Silica gel is a natural mineral that you can find in those little so-called desiccant packets placed in packaging for various products—you know, the ones that say “Do Not Eat” on them. The reason so many manufacturers use silica gel packets in their packaging is because the mineral is highly, highly absorptive. It helps keep products dry and moisture-free during storage and transfer. Alone, silica gel is non-toxic, non-flammable and chemically unreactive…meaning it’s pretty safe overall. The reason why these packets say “Do Not Eat” is that silica gel is sometimes “enhanced” with a moisture indicator chemical, like cobalt chloride, which can cause cancer. Yikes. It Helps Detecting Health Problems: touted as a “health monitoring cat litter,” PrettyLitter crystals actually change color depending on what’s in your animal’s urine. This is SUPER helpful for many pet parents who want to stay in the know about their animal’s health, even though their cats can be a bit stoic (for lack of a better word) and not show when they’re feeling unwell. As an example, crystals will turn blue or green if there’s high urinary pH (alkaline), which could indicate a urinary tract infection. Crystals will turn orange or yellow if there’s low urinary pH (acidic), which may indicate metabolic acidosis or kidney acidosis. Lastly, crystals may turn red or purple if blood is present, which could indicate bladder inflammation, UTI, or bladder stones. Delivered on a Monthly Basis: you simply let them know how many cats you have and they’ll help you figure out how much you need per month…conveniently delivered to your home! No more last minute trips to the pet store, no more hauling heavy bags from your car to the litter box (plus, it’s up to 80% lighter than the leading clumping brands!). PrettyLitter company even offers to pay for shipping, and you can easily change your order via your online account. Easy To Scoop: we know how annoying it is to scoop out waste only to have it break up in tiny granules and fall right back into the box. PrettyLitter is designed to be easy to sift and scoop for fast clean-up. You “only scoop the poop,” since the urine is completely absorbed by the crystals. Less time on the litter box chore, more time playing with your four-legged sweetheart. Superior Odor Control: unlike regular clumping littler, PrettyLitter absorbs and eliminates moisture (and all the pleasant odors that comes with it). Plus, the litter itself is scentless, which is great for anyone in your home (human or feline) with sensitive noses or skin. Lasts Longer: thanks to its unique formula, a single bag of PrettyLitter typically lasts one whole month (per cat)…at least according to the company. This is no small part due to the fact that the pretty litter is able to full absorb moisture and smells…so you don’t have to refill and replenish the litter granules as often. No kitty litter is perfect. And different homes, different kitties, and even different cat owners will find different benefits and drawbacks to the same product. One of the main drawbacks of PrettyLitter is that it seems to track around the home. This is probably because the crystals are so fine and lightweight…meaning they can trap on your cat’s paws easily and go with them when they jump out of the litter box! To mitigate this potential tracking issue, putting a good anti-slip mat under the litter box (that extends out beyond the edges of the box itself) may help. And then again, some owners have found that the litter doesn’t stick to their animal’s paws at all. You may be more likely to run into the tracking problem if your kitty has long hair. Another problem some users have found is that one bag doesn’t last one month (per one cat) as advertised. In fact, some pet parents have concerns that the litter box just fills up with urine once the crystals become too saturated. This could be more likely to happen to you if you have multiple cats or if you have a large cat that tends to urinate frequently. How to resolve? A few owner have said that if you just stir the litter crystals about once per day, it helps minimize or eliminate urine pooling, especially toward the end of the month once the crystals are becoming saturated. 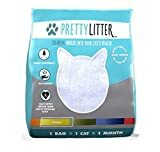 The Pretty Litter reviews on Amazon are overall pretty glowing, although there are a fair share of pet parents who seem a bit less than impressed. For one thing, some owners complain about the expense. It is a bit more pricey than regular kitty litter. That said, thanks to the convenience of monthly delivery AND the advanced “health-monitoring” feature, some pet owner feel that the added costs are well worth the added benefits. The PrettyLitter company even suggests that you can save money on vet bills in the long run thanks to the early detection ability of the litter. One popular positive remark from cat owners is that the litter is sewage safe—that is, they can scoop out the feces and flush the solid waste down the toilet for super easy clean-up. Honestly, a lot of owners simply like the way it looks, too. Unless there’s something off with a cat’s urine, it’s not easy to visually tell if the litter has been used at all. Overall, it stays pretty clean throughout its lifespan in the animal’s box. As far as the way cats feel about it, some seem to love it while others seem pretty turned off by it. This really may just come down to temperament. For instance, many cats don’t like change and will have a hard time adjusting to new litter. Worried that this sounds like your kitty? Try introducing it to her slowly. Put it in its own box next to her old litter box, and add a few of her old litter granules. At the same time, stop cleaning out her old box. Yeah, we know this may introduce some temporary unpleasant smells in the home. But the idea is to encourage your kitty to go in the clean box instead of her old one. Eventually, once she’s consistently going with her new prettier litter, you can simply remove the old litter box…but maybe save the extra box for a backup. Lastly, most pet parents seem to rave about the odor-eliminating ability of the product—which if you think about is really the whole point of good kitty litter! It’s pretty simple to use. You just pour the crystals into your cat’s litter box and scoop out the solid waste as needed. One bag should last about a month (although, as we’ve said, not every cat owner has had this success). PrettyLitter is definitely a unique product. It could be the right choice for your home, especially if you want to enjoy the convenience of monthly delivery, lightweight and absorbent crystals, and infrequent litter changes. Does your sweet feline also have sensitive skin or respiratory issues? Then PrettyLitter could help her go comfortably. The good news is if you try it out and decide it’s not for you, you can cancel your membership at any time. So feel free to give it a go…you really don’t have anything to lose…other than maybe the unpleasant litter box smells!